The Buddhist Studies Forum at the University of British Columbia, with the assistance of the Research Center for Buddhist Texts and Arts (RCBTA) at Peking University and the Glorisun Global Network of Buddhist Studies at Cambridge, cordially invites proposals for an international conference on “Production and Preservation of Buddhist Manuscripts in Central and East Asia” to be held between August 29-31, 2018, at Cambridge, United Kingdom. The conference is made possible with generous support from the Glorisun Charitable Foundation based in Hong Kong. The discovery of the cache of manuscripts and other materials in cave seventeen of the Mogao Grottoes, near Dunhuang, in western China, early last century has kindled the new field of the study of Central and East Asian Buddhist manuscripts. Discoveries in Japan late last century of twelfth-century copies of much earlier manuscripts, in addition to the treasury of documents preserved in the Shōsōin (Shōgozō), and at sites in Korea, Chinese Central Asia, India, Pakistan, and Afghanistan, compel scholars to reconsider not only how we think about the transmission of Buddhist literature and religious teachings, but also the production and preservation of Buddhist texts and books across a broad geographical and chronological span. This conference explores the trans-cultural, multi-ethnic, and cross-regional production, preservation, and uses of premodern Buddhist manuscripts in Asia. Paleographical, codicoligical, or doxographical aspects of premodern Buddhist manuscripts. 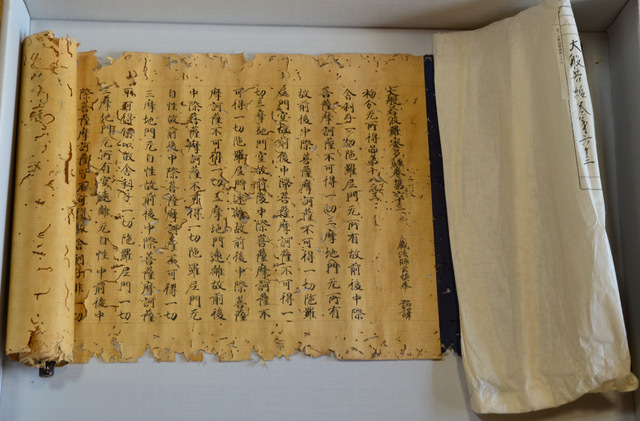 The organizing committee welcomes paper proposals related to any aspect(s) of the multidisciplinary, inter-cultural, and cross-regional study of manuscripts and manuscript cultures in Central and East Asia. All conference-related costs, including, local transportation, meals and accommodation during the conference period, will be covered by the conference organizers, who—depending on availability of funding—may also provide a travel subsidy to selected panelists who are in need of funding. A conference volume will collect all the papers in English, plus the English translations of several papers written in non-English languages; a Chinese volume, to be published in China, will include the Chinese versions for all non-Chinese papers in addition to those papers contributed by our colleagues based in China. Only scholars who are confident in finishing their draft papers by the end of July and publishable papers by the end of 2018 are encouraged to apply. Please email proposals and CVs to frogbear.project@ubc.ca by April 30, 2018. This conference is planned as part of our annual Intensive Program of Lectures Series, Conference/Forum, and Fieldwork on Buddhism and East Asian Cultures at Cambridge, sponsored by UBC’s SSHRC partnership project of Buddhism and East Asian Religions (www.frogbear.org) and the Glorisun Global Network of Buddhist Studies the latter of which involves several top universities in East Asia, North America and Europe (http://glorisunglobalnetwork.org). Interested graduate student and post-doctoral fellows are welcome to apply for the whole program (details can be found here).